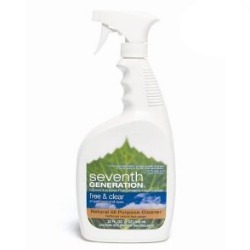 Kerry has shared her Seventh Generation all purpose cleaner review, in the free and clear scent. I like to use natural products around the house, because I have an active toddler who is constantly getting into everything. Since he puts everything into his mouth I don't want him to run the risk of consuming harmful chemicals. That's why I often end up buying Seventh Generation cleaning products. One of my favorites is their all-purpose cleaner. You can use it to clean up almost any type of mess, and it doesn't contain any perfume or dyes. Also, it's hypoallergenic, good for the environment (biodegradable) and non-toxic. I feel totally comfortable using it everywhere to clean up all the messes my little one makes around the house. It works very well, and it doesn't leave a nasty chemical residue or emit any harmful chemical fumes. Also, it's not tested on animals, which is an issue that's very important to me. I would much rather use this product than the artificially-colored, strongly perfumed cleaners one usually finds at the supermarket. Thanks Kerry for your Seventh Generation all purpose cleaner review. As a Mom myself, I totally understand what you mean about worrying about my kids ingesting or even just being exposed to chemicals while I clean my home. That is why I've really started exploring all the Earth friendly cleaning products brands available, to find out which ones are actually the best for the environment, our health, and clean well too. Has anyone else used this product? If so, I would love to hear how you use it around your home, and how it has worked for you, good or bad. You can share your Seventh Generation cleaning products review here, or read other reviews that have already been submitted for many of their additional products. In addition, you can share your natural all purpose cleaner review here, or read other reviews which have already been submitted for many other products.